Intravenus de Milo (Megaphone, 1974): First Tap album to go bronze (two levels below platinum) after 1 million copies were returned to stores. Rated B- by Entertainment Weekly, which concluded it was "suffering from a certain sameness that set in during Taps meteoric rise to the middle of the pack." Included "Tonight Im Gonna Rock You Tonight" (which would later appear on the soundtrack album) and "Saliva of the Fittest." 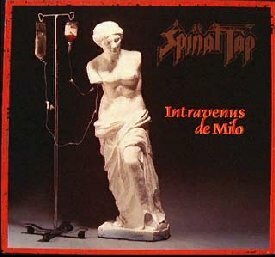 During "This is Spinal Tap," director DiBergi reads the band one of the reviews that the album received: "This tasteless cover [of the famous Venus de Milo sculpture with an IV tube connected to her stump] is a good indication of the lack of musical invention within. The musical growth rate of this band cannot even be charted. They are treading water in a sea of retarded sexuality and bad poetry." Nigels response was succinct: "Now thats nit-picking, isnt it?"